All right, the first new Lego Superheroes set of 2014 is out, and it’s one of the best DC sets to date. We finally have a mid-priced set that has a basic (not Arctic, not Glider, etc.) Batman minifigure! Oh, and a Nightwing and Man-Bat too. The Man-Bat Attack set also includes a Bat-Copter (with firing missiles, spinning rotors and an extending hook) and a glider for Nightwing. Complexity: This set has just 184 pieces, and only a handful of them are the more complex Technic elements, so it’s a pretty simple build. I spent about 30 minutes putting everything together. Playability: Not gonna lie, I bought this one for myself, and mainly to display the minifigures, but my son had fun playing with the copter and glider. The copter is a bit on the fragile side, so it may not hold up well if your kids play rough. Other than that it’s hard to imagine any kid not having a blast with this set. This is just a fantastic Lego Superheroes set all around. It looks great, is a lot of fun, and for the price (20 bucks is the suggested retail price) it’s the best way to get the Batman and Nightwing minifigures without getting a much larger set. 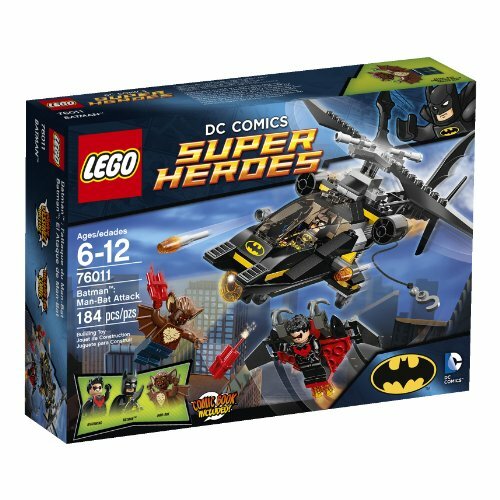 0 Response to "New LEGO Superheroes 76011 Batman Man Bat"